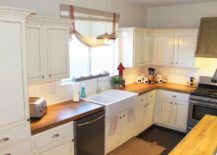 Wooden countertops are a popular choice among many homeowners who love a classy kitchen with an elegant and traditional look. 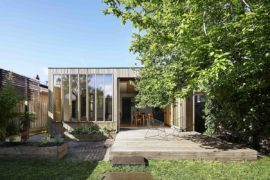 But it’s not just about the looks – first and foremost, wood is a great sustainable material. It’s a great surface to work on, whether you’re cutting up the produce or preparing your meals, it will always work in your favor. 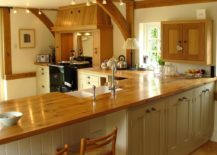 Since there is a big variety of wood to choose from you can find exactly the type that fits your taste and aligns with the vision of your dream kitchen. 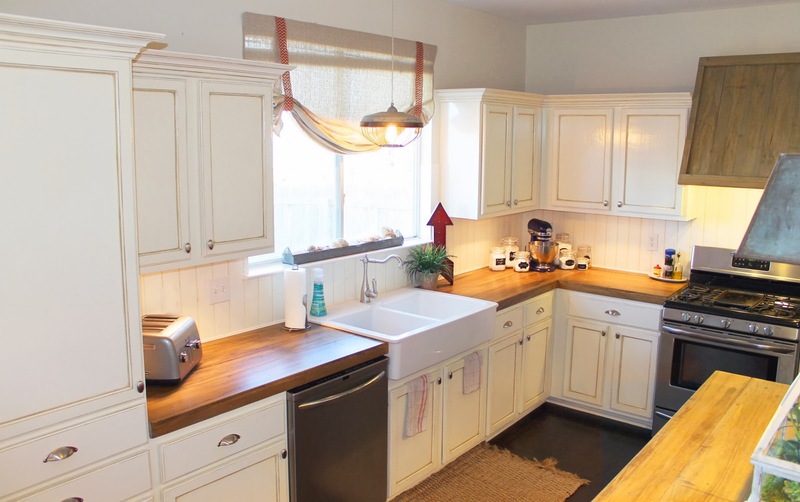 Find some inspiration in our collection of charming and classy wooden kitchen countertops! 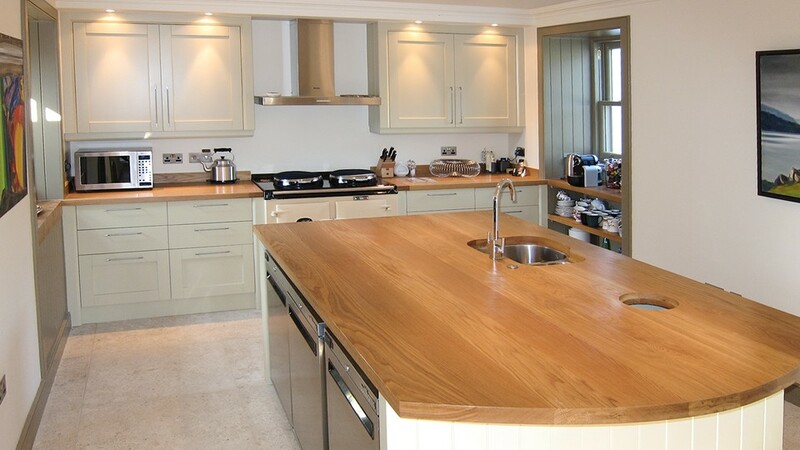 A light wooden countertop carries the gentleness that gives your kitchen a fresh, elegant and stylish appearance. 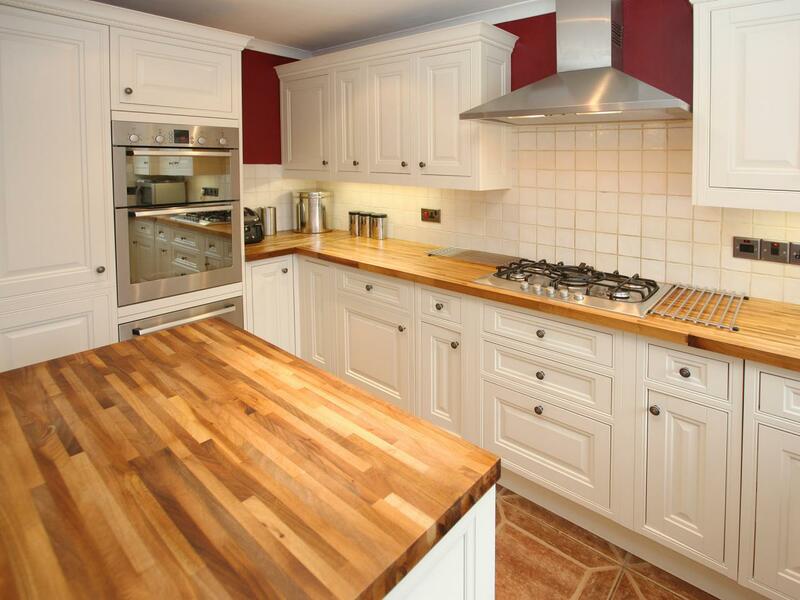 Ideal for bright white kitchens, this choice of wood has a unique charm! 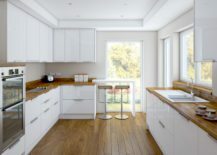 Its warm but minimalist look has the power to make any space around itself friendly and cheery – perfect for a family kitchen! 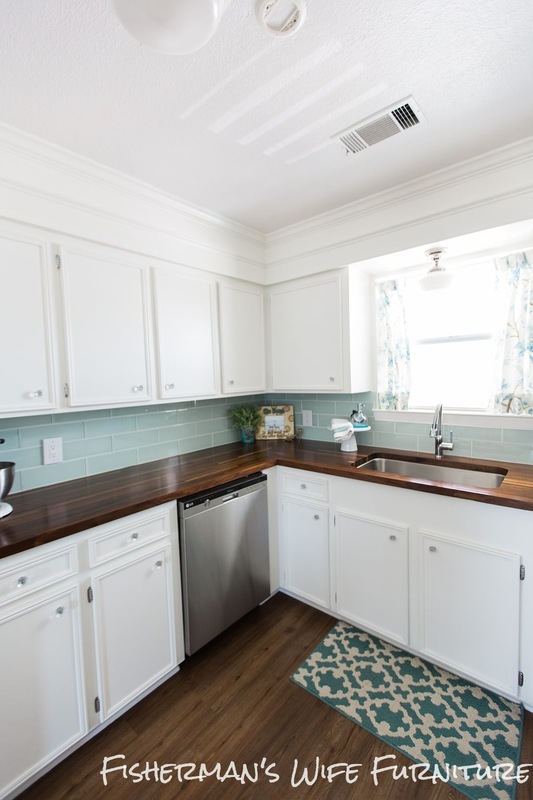 Paired with white kitchen cabinets and backsplash tiles, the light wooden countertop is the element that stands out and adds charm to the elegant and simplistic interior. 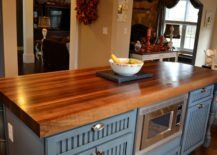 A big kitchen island takes a lot of space, therefore it calls for a brighter shade of wood for the countertop to balance out the room and make it feel open. 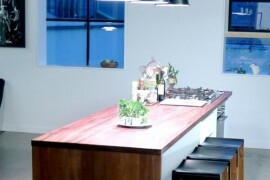 Simultaneously you get a vast working surface which is something every amateur chef can appreciate! 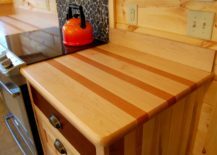 The simplicity of wood has no match. 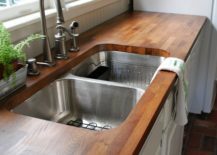 This wooden countertop doesn’t need any extra decorative elements to be beautiful or noticeable; its bare look stands out enough on its own! 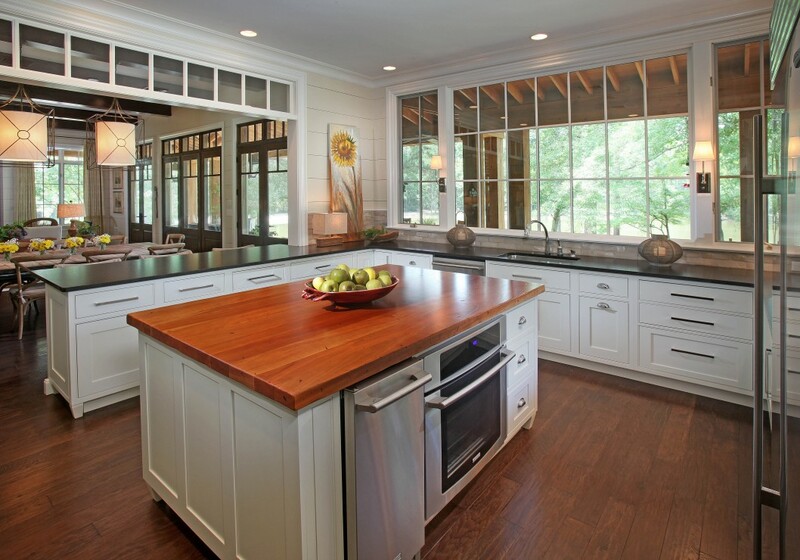 To make a big kitchen appear even greater, choose a light shade of wood to emphasize the open space! 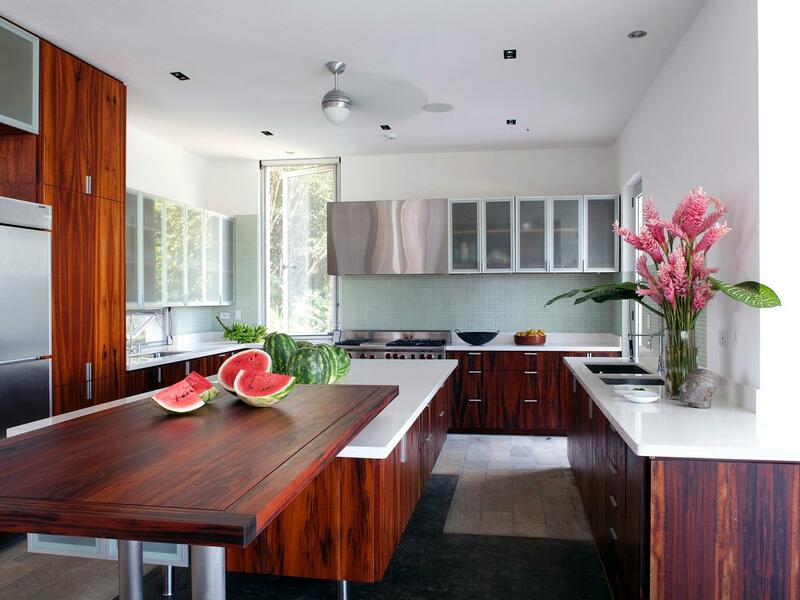 If your kitchen has visible beams, the wooden countertop will make sure the whole space feels matching and harmonious! 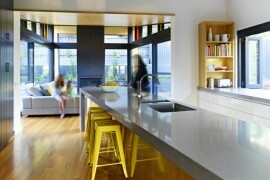 Some kitchens have a lot of counter space and some have less. It’s a personal choice, but however much of it you need, wood is a great material that will work both in a setting with a long counter and one with a short counter. 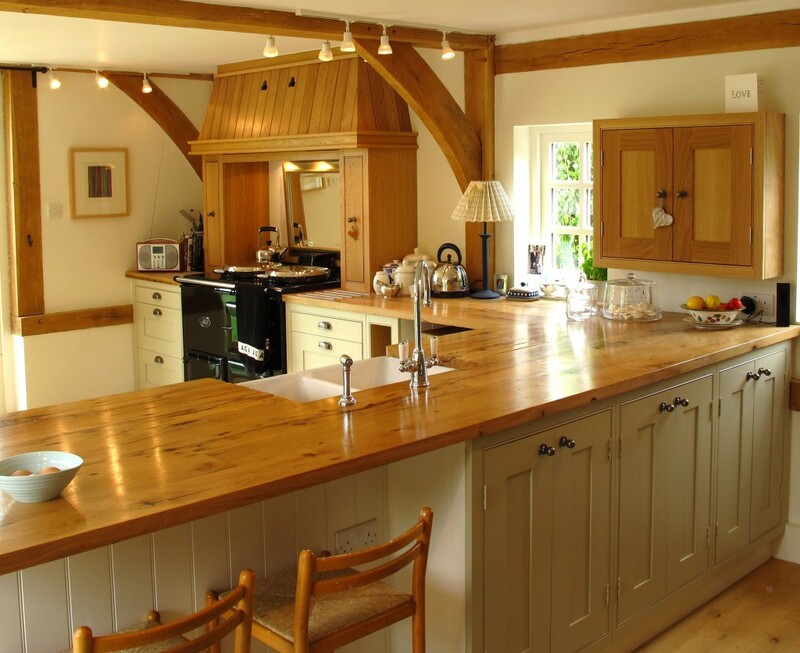 It has the charm of appearing like it extends the surface, meaning that a short counter will still feel very spacious and a long one will seem like the greatest element in your kitchen! 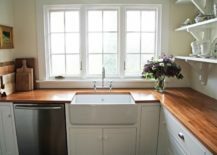 Light wooden countertops aren’t for bright kitchens alone! 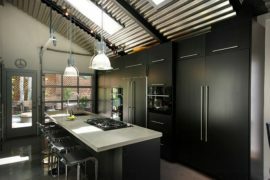 They can perform amazingly in a kitchen with a striking dark interior as they add a hint of lightness to the dim room. 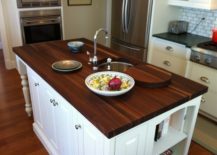 A great thing about a wooden countertop is that it can easily be paired with other materials. 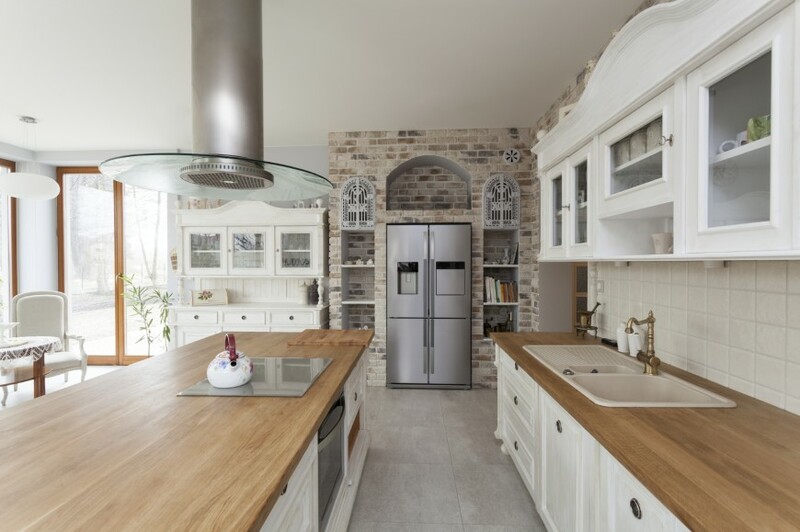 If your kitchen has more of a modern styling, light wood will stand out against metallic silver appliances and a bare brick wall! 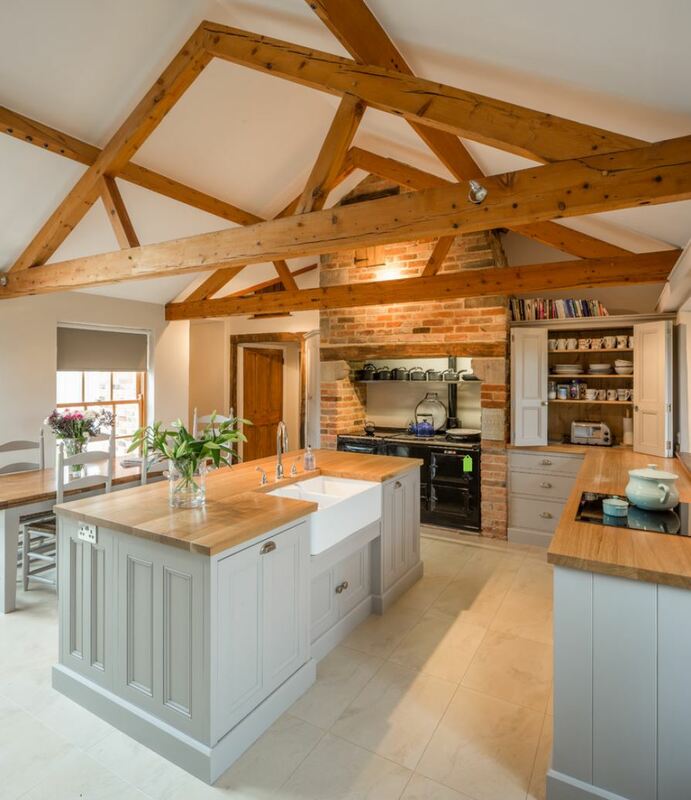 The brightness and breeziness of this kitchen is absolutely stunning! The big windows let in great amounts of daylight that illuminates the space thanks to the white interior and fair wooden countertop. 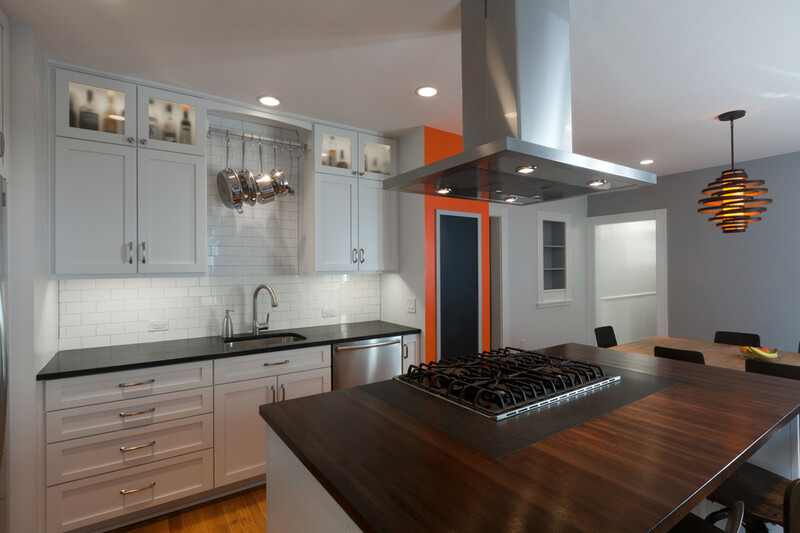 If a kitchen space starts to feel too narrow, the easiest way to optically extend it is by picking out the right color scheme. Sticking to light and pale colors is the best choice! 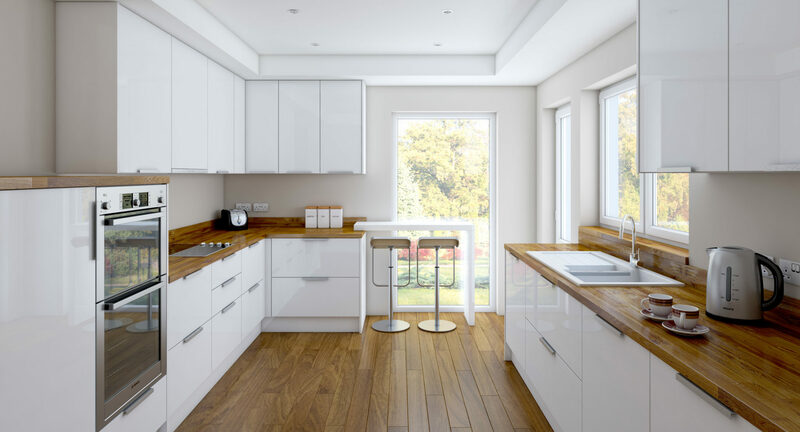 This white kitchen with a simplistic wooden countertop is a great example! 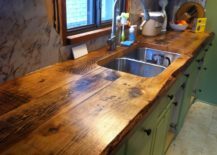 Create a true rustic ambiance with a pale raw-edge wooden countertop that is perfect for any farmhouse-styled home that wants to take the natural decor to the next level! Dark wood has a profound character that cannot be embodied by any other material. It’s compelling, elegant and tasteful! 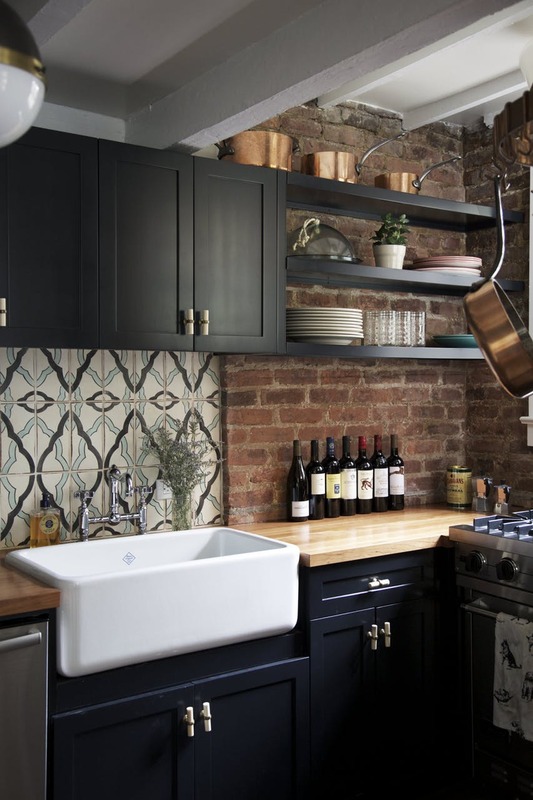 A dark wooden countertop is one of those striking elements that absolutely consume the room and breathe into it a delicate style that sets the bar for all of the other elements within. 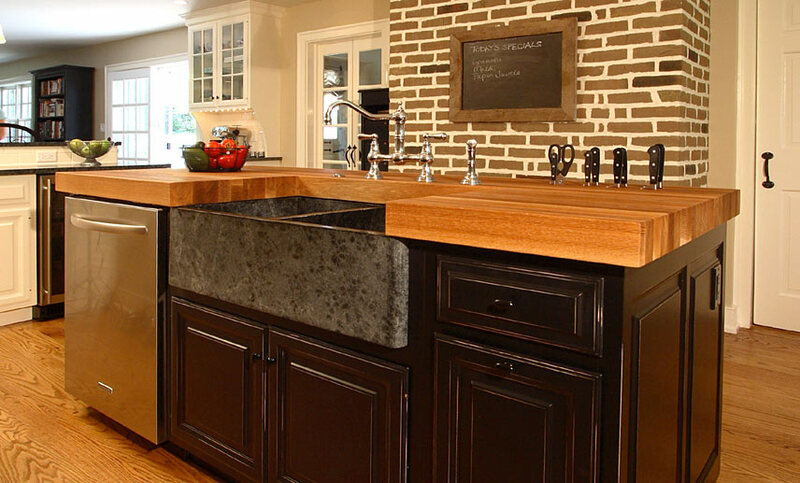 If you want your kitchen to always look exceptional, a dark wooden countertop is a must-have! 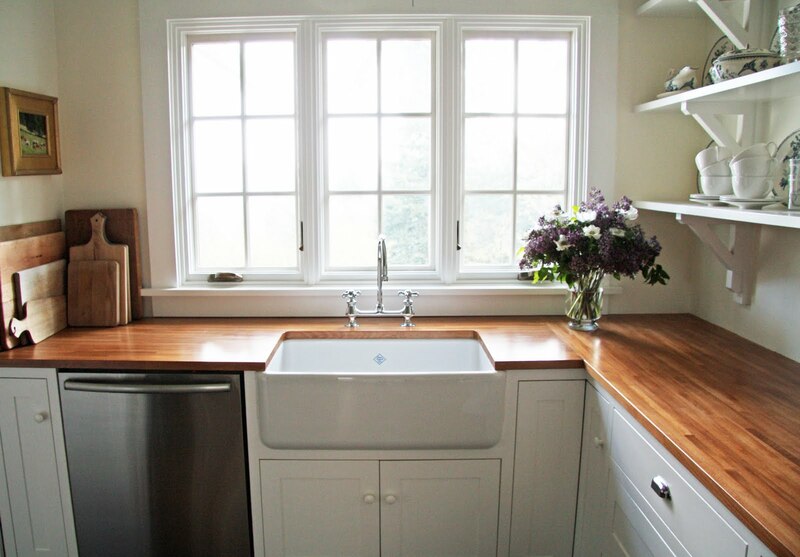 If you want the dark wooden countertop to stand out in your small kitchen, pair it with white kitchen cabinets! It also brings harmony to the bright interior and is the ultimate focal point of the room! 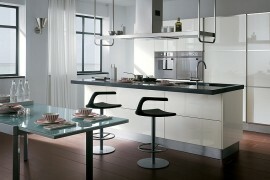 The elegant feeling of your kitchen will only be enhanced by a remarkable dark countertop. It’s a very classy choice, one that shows off your exquisite taste! The mixing of different materials can be a fantastic way to bring variety into your living space. 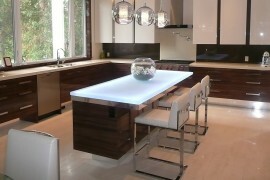 This kitchen mixes marble countertop with a dark wooden one and the result is a dynamic but noble kitchen space! If you want to bring some contrast into your all-white kitchen, a dark countertop is an amazing choice! It will be that element of surprise that gives a sense of direction to the whole space. 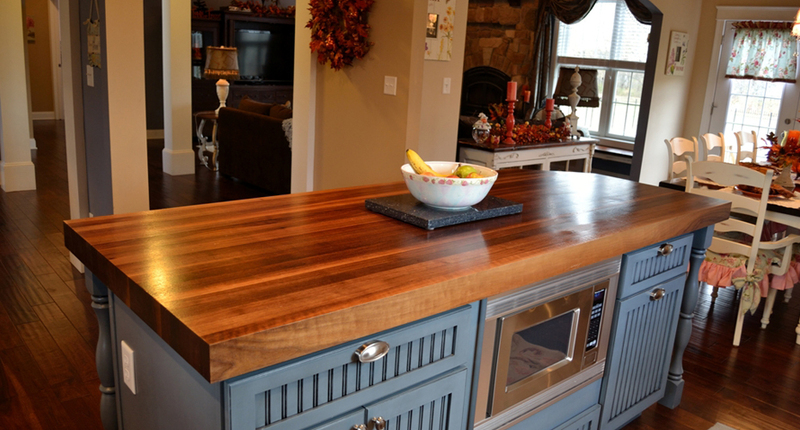 A kitchen island with a dark wooden countertop is the ultimate centerpiece. It’s the most eye-catching element of the room and one that definitely steals the spotlight! The modern minimalist kitchen is neat and sophisticated, defined by the dark countertop that creates an air of depth and mystery! This wooden countertop is both modest and compelling, a striking element for any kitchen that needs a high-class countertop with a dark charm! A kitchen is that special place of the house where you prepare meals for your loved ones. As such, it should always feel cozy, homey and very welcoming. 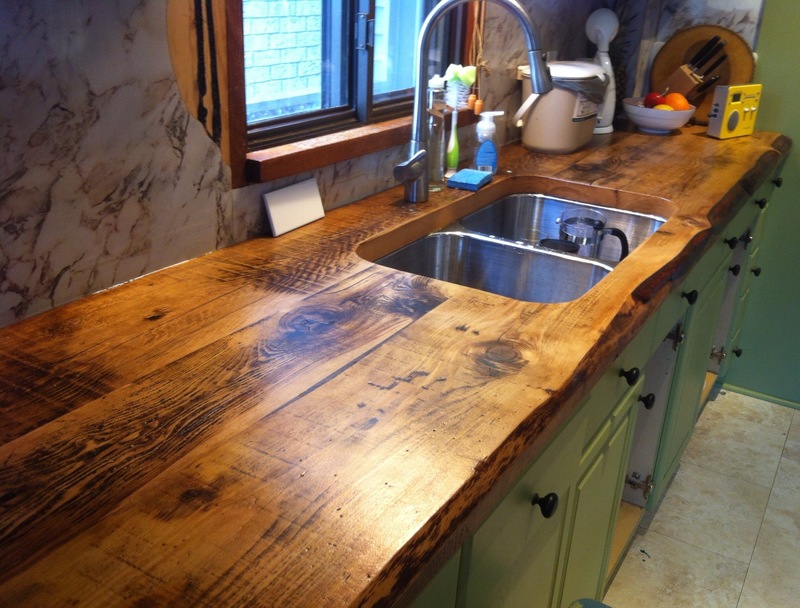 Wood naturally brings this into the space so it’s a fantastic choice for a countertop! 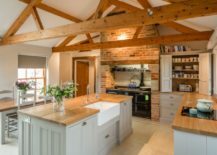 If you are going for a raw and rural look, set out to find a wooden countertop with a rough rustic style that channels the tradition of the countryside. 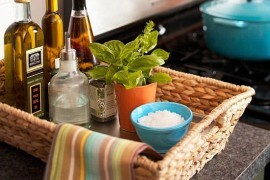 A small and cozy kitchen calls for a countertop that doesn’t take away from the comfort of a smaller space. 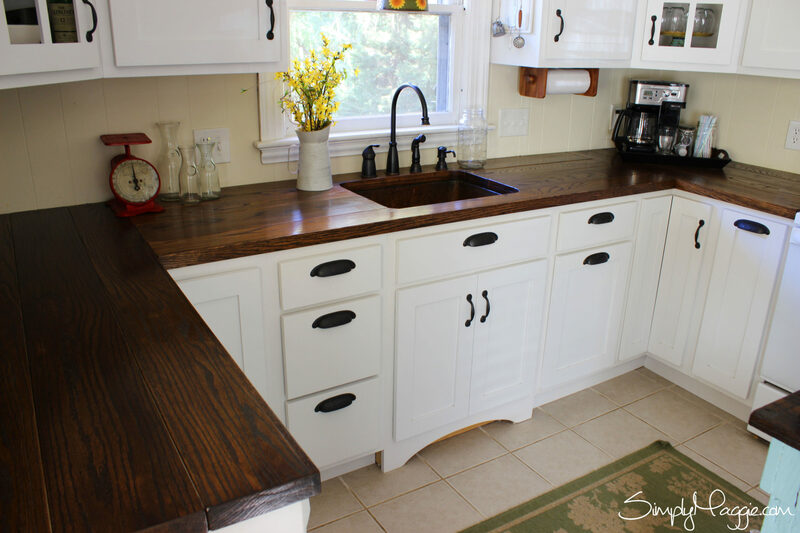 Given its warm and familiar look, it’s hard to find a better choice than a dark wooden countertop! Sometimes we say that an element truly shines to suggest that it stands out and draws attention. 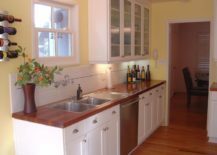 But in the case of polished wood, both is true: a polished wooden countertop will literally shine and, as such, be the absolute focal point of your kitchen, giving it a classy, grandiose look! 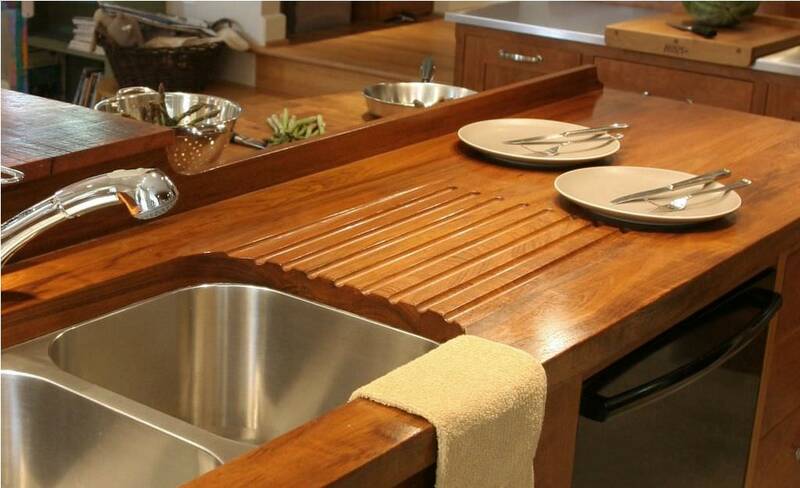 A big kitchen island of a dynamic shape will seem even bigger with a wooden countertop that shines with its polished beauty! If you are wishing for a glamorous and superior look, a polished countertop will absolutely deliver! 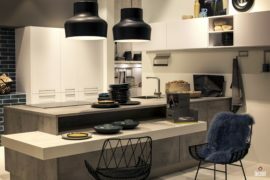 Do you want your kitchen island to stand out and be a unique element in your minimalist kitchen? 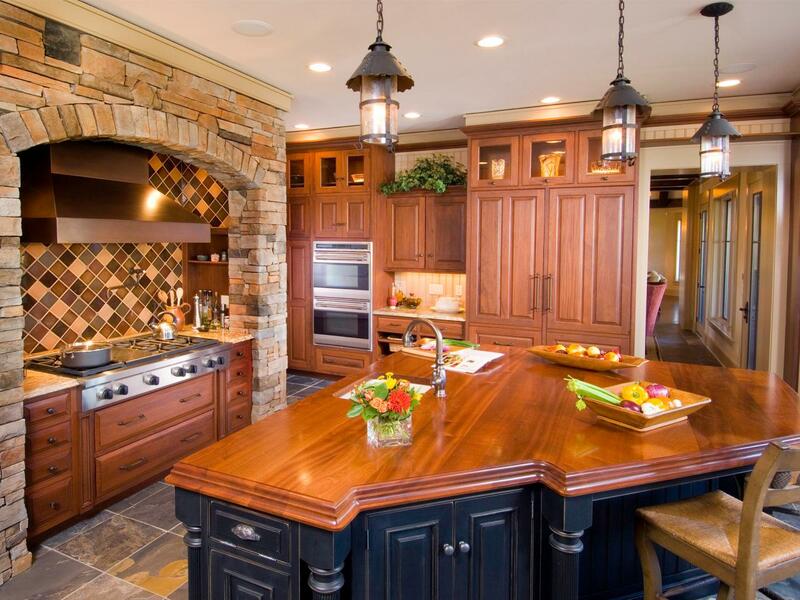 Choose a different material for the island counter than for the kitchen counter! 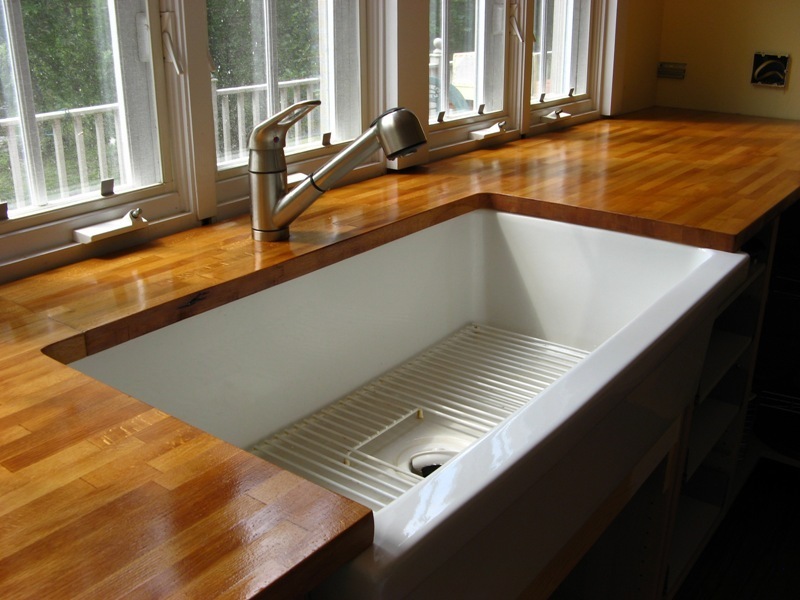 By now you can guess that we’ll recommend a polished wooden countertop with a distinct glow! 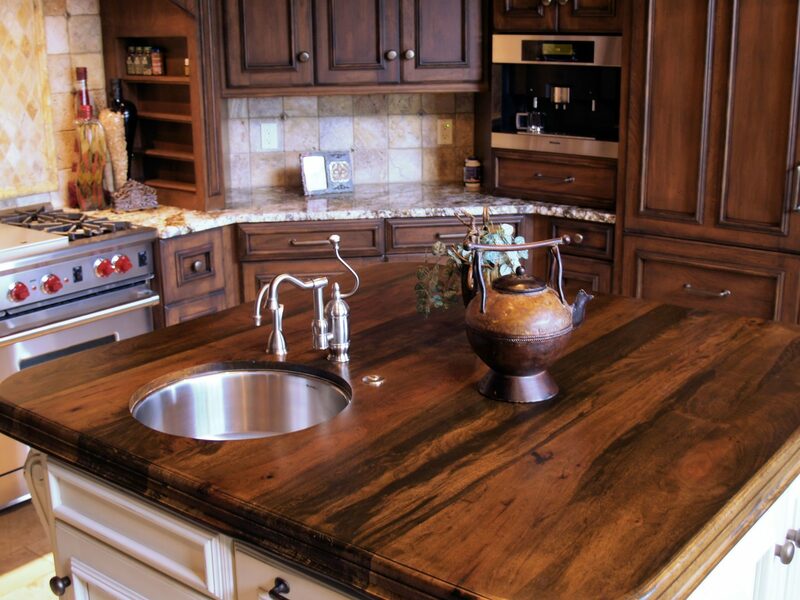 As the morning light hits your kitchen, you’ll want a countertop that makes the best of the natural lighting! 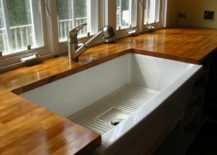 Pick a polished wooden countertop and watch how it glows in the sunlight! 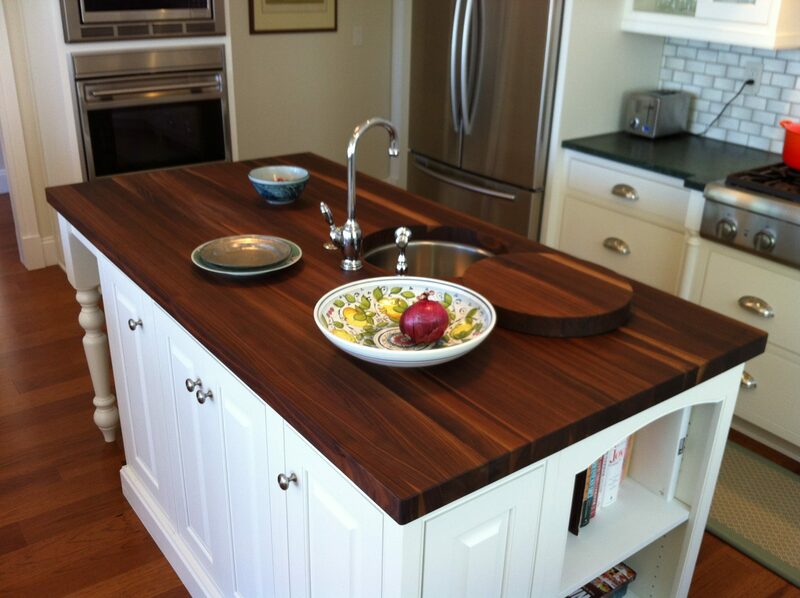 Not only is a wooden countertop a classy choice, it can also be very alluring and captivating! Something about the shiny polished look draws us in and makes us want to spend more time in the kitchen – which is always a good idea! 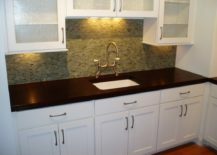 This charming polished countertop will find its rightful place in a kitchen that could use some glow, style and charisma! 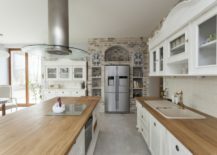 At the end of the day, your kitchen should always feel true to your domestic values and be the representation of the interior you wish for your home. 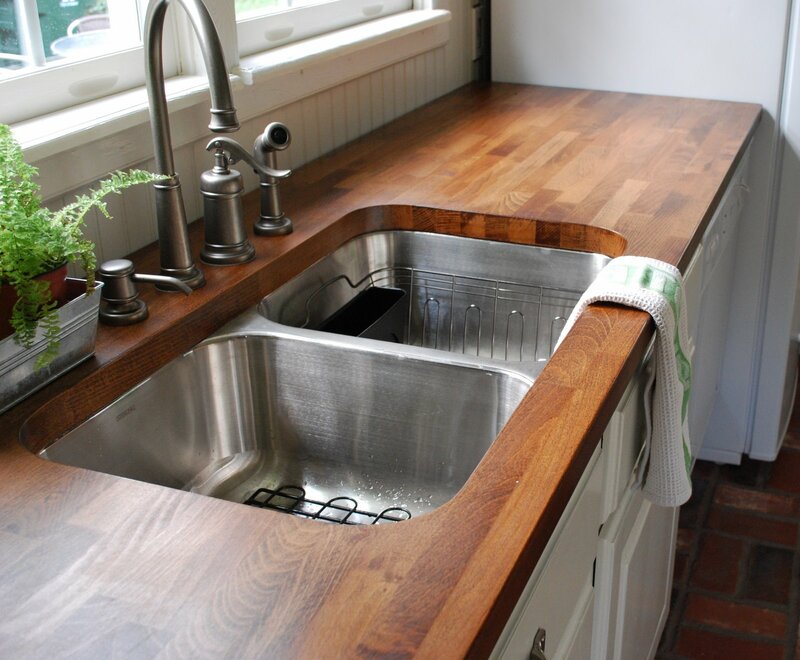 If you are feeling the call of polished wood, a shiny countertop cannot be missing from your kitchen!